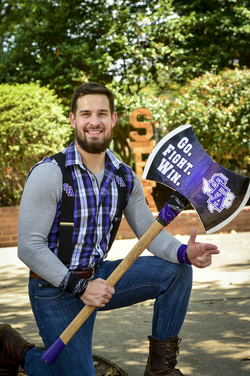 Brett Payne, senior marketing major of Houston and former Marine, serves as Stephen F. Austin State University's newest Lumberjack mascot. NACOGDOCHES, Texas -- Brett Payne hasn't always had a beard, but now that he's the newest face of the Lumberjack mascot, it's just another part of the job. "I was really skeptical about coming into it, but the spirit team took me in with open arms and with no beard at all," said Payne, senior marketing major of Houston. "It gave me the discipline I need to stay focused in my classes, as well as the confidence and drive I need to be able to put myself out there and meet people, which is how I became the mascot in the first place," he said. Originally setting his sights on another Texas institution, Payne signed up for fall classes at SFA to stay busy while remaining close to family, but when he set foot on campus, something happened he didn't expect. He felt at home. "I didn't really know anything about SFA," he said. "The first day of class was the first day I stepped on campus. I was just walking around and fell in love with it." Part of what helped smooth his transition was Veteran's Resource Center Coordinator John Fontenot's commitment to making sure Payne succeeded. "Unfortunately, people have an image of veterans as disgruntled or antisocial, but John was big on me not being that way and branching out," Payne said. "The next thing I know, I'm signing paperwork and growing my beard out," he said. He donned the purple plaid shirt, suspenders and boots of the Lumberjack uniform for the first time at the beginning of the year and hasn't looked back. "There are so many ways he's an asset to our program," Maple said. "Having the military background he has, he gets the idea of working hard toward a goal." As Lumberjack, Payne attends every home game for basketball and football, as well as women's basketball and volleyball when the university lacks a Ladyjack mascot. He also makes appearances when requested. New to competitive cheer, Payne didn't know what to expect when he signed on to the program. "I was the first to say cheerleading is not a sport until I joined the team, but these individuals on the cheer team at SFA are some of the most talented athletes I've ever been around and just all-around good people," he said. Without a character suit to hide behind, the success of a live mascot's performance relies solely on personality, Maple said. To do it well, Payne has to approach the experience with an open mind and steeled nerves. "You can't be shy," Payne said. "People are usually genuinely kind of scared in front of other people. They don't want to give anyone a reason to laugh at them, but in this, if you don't go a 100 percent, people aren't going to respond to what you want them to do." "It's pretty exhilarating because for however long the game is you're somebody completely else," he said. "You take on a different persona and different personality. You're the Lumberjack." When Payne signed on, Maple hadn't intended to use him at the national competition because of his lack of experience, but his work ethic quickly changed his mind. "Even though he wasn't competing on the mat with the cheerleaders doing the skills, he was still there at every single practice to motivate, cheer on and make sure he was being a part of that team," Maple said. Payne traveled to Daytona for the 2018 NCA and NDA Collegiate Cheer and Dance Championship and was immersed in a world of intense competition. The spirit program has won numerous awards at nationals and placed in several categories in Division I at this year's competition. "We all love the sport side and school spirit, but representing your school actually as athletes - not as cheerleaders on the side - makes it a completely different experience," he said. "You are the face of SFA in that environment." "All of those people are the reason I'm here right now," he said. When his career as the mascot comes to an end, Payne isn't positive what he'll do next, but whatever it is, he knows it will be something he is just as passionate about. "I made a promise to myself when I got out of the military that whatever I do, I just want to do something I love," he said. "Until they tell me to stop," he said, "I'm just going to keep it going."